Flora of the Canadian Arctic Archipelago - Empetrum nigrum L.
Inuktitut: Paurngait, paurngaqutiti, augujjiaq; kallat (Coral Harbour). Published in Sp. Pl. 1022. 1753. Type: Described from Europe, selected by Good, J. Linn. Soc., Bot. 47: 512. 1927. The typification assigns the name to the European diploid and dioecious plant. Holotype: LINN 1160.2. Synonymy. Empetrum hermaphroditum Lange ex Hagerup, Dansk Bot. Ark. 5, 2: 1. 1927. Empetrum nigrum L. var. hermaphroditum (Lange ex Hagerup) T.J. Sørensen, Meddel. Grønland 101(3): 95. 1933. Empetrum nigrum L. subsp. hermaphroditum (Lange ex Hagerup) Böcher, Meddel. Grønland 147(9): 81. 1952. Empetrum eamesii Fernald and Wiegand subsp. hermaphroditum (Lange ex Hagerup) D. Löve, Rhodora 62: 289. 1960. Empetrum hermaphroditum Lange ex Hagerup var. americanum V. Vassil., Rod. Empetrum 56. 1961. Empetrum subholarcticum V.N.Vassil., Ref. Nauchno-Issl. Rabot., Otd. Biol. Nauk 1945: 3. 1946/1947. Empetrum nigrum L. subsp. subholarcticum (V.N.Vassil.) Kuvaev, Bot. Zhurn. 76(8): 1172. 1991. Empetrum androgynum V.N.Vassil., Ref. Nauchno-Issl. Rabot., Otd. Biol. Nauk 1945: 3. 1946/1947. Empetrum nigrum L. subsp. androgynum (V.N.Vassil.) Kuvaev, Bot. Zhurn. 81(10): 113. 1996. Empetrum arcticum V.N.Vassil., Ref. Nauchno-Issl. Rabot., Otd. Biol. Nauk 1945: 4. 1946/1947. Empetrum polare V.N.Vassil., Ref. Nauchno-Issl. Rabot., Otd. Biol. Nauk 1945: 3. 1946/1947. Empetrum atropurpureum Fernald and Wiegand, Rhodora 15: 214. 1913. Empetrum rubrum Vahl ex Willd. var. atropurpureum (Fernald and Wiegand) R.D. Good, J. Linn. Soc., Bot. 47: 519. 1927. Empetrum eamesii Fernald and Wiegand subsp. atropurpureum (Fernald and Wiegand) D. Löve, Rhodora 62: 288. 1960. Empetrum nigrum L. var. atropurpureum (Fernald and Wiegand) B. Boivin, Naturaliste Canad. 93: 433. 1966. Empetrum purpureum Raf., New Fl. 3: 50. 1836. Empetrum nigrum L. f. purpureum (Raf.) Fernald, Rhodora 25: 83. 1923. Empetrum eamesii Fernald and Wiegand, Rhodora 15: 215. 1913. Empetrum rubrum Vahl ex Willd. subsp. eamesii (Fernald and Wiegand) R.D. Good, J. Linn. Soc., Bot. 47: 519. 1927. Empetrum nigrum L. var. eamesii (Fernald and Wiegand) B. Boivin, Natural. Canad. 93: 433. 1966. Empetrum rubrum Vahl ex Willd. var. eamesii (Fernald and Wiegand) Cronquist, in Gleason and Cronquist, Man. Vasc. Pl. Northeast U.S. and Adjacent Canada, ed. 2: 864. 1991. Vegetative morphology. Plants 5–10(–30) cm high; shrubs; dwarf shrubs, or low shrubs. Horizontal stems at ground level, branching extensively to shape plant habit as mats. Aerial stems prostrate (usually), or ascending (occasionally growing somewhat erect to 20–30 cm high in warmer sites, or by rocks). Aerial stem trichomes spreading, or erect. Leaves present; distributed along the stems; alternate (close together and approaching whorled); persistent. Petioles absent. Leaf blades simple. Leaf blade bases attenuate. Blades 2–6 mm long, 0.5–1 mm wide, spreading or divaricate, linear, revolute, with inconspicuous veins. Blade adaxial surface glabrous (superficially the leaves appear glabrous) or hairy, hairs glandular (tiny, glandular hairs seen at 40×). Blade abaxial surface hairy. Blade margins revolute, with non-glandular hairs (these overlapping along the revolute leaf margins making a still air pocket on the abaxial surface of the leaf); apices acute, or obtuse. Reproductive morphology. Plants monoecious, or dioecious (usually), or bisexual. Flowering stems two or more per plant; with leaves (single flowers are on "short shoots" that arise laterally from the main axis and bear only scale leaves below the flower). Flowering stem glandular hairs present, or absent. Flowers solitary (in leaf axils). Flowers small (1–2 mm); bisexual. Sepals conventional; 3; free; 0.08–0.12 mm long; 0.2–0.3 mm wide; green, or purple (green at base, purple towards the apex); petaloid. Calyx without sessile glands; glabrous. Petals conventional; free; 3; purple; unlobed; 1–2 mm long. Stamens 2. Anthers ovoid (without appendages); 0.6–0.8 mm long. Nectaries absent. Ovary superior; carpels (2–)4–9; syncarpous. Ovaries sub-globose; glabrous. Styles variable; partially fused (hollow, the cavity fluted in alignment with the carpels). Placentation axile. Ovules per ovary 2–5. Fruit sessile; with calyx persisting; fleshy; a berry (in appearance), or a drupe (technically); spherical; black, or purple, or blue; 3–8 mm long; 3–8 mm wide; glabrous; surface appearing veinless; indehiscent. 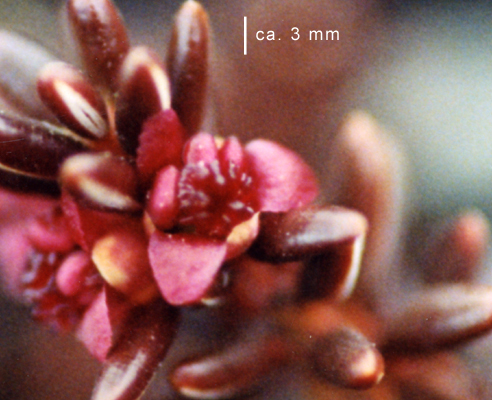 Seeds 2–9; 1.6–1.8 mm long; brown (to pale reddish); surfaces verrucose (minutely). Chromosome information. 2n = 52. 2n = 52. Hagerup (1927, Greenland? ); Arwidsson (1938, northern Europe); Flovik (1940, Svalbard); Löve, in Arwidsson (1943, northern Europe); Löve and Löve (1956, Iceland; 1959, northeastern North America; 1961d, northern Europe; 1966, northeastern USA); D. Löve (1960, northeastern North America); Hedberg and Hedberg (1964, Sweden); Ulsaker, in Engelskjøn (1979, Norway); Engelskjøn (1979, Svalbard); Löve and Löve (1982a, central Canada). Several more southern counts. Indigenous knowledge. An Inuit name is paurngait, meaning blackberries. Ootoova et al. (2001) reported that the word paurngait means "which looks like pauq (soot) because they are black in colour. They are very healthy to eat, juicy, and crunchy. 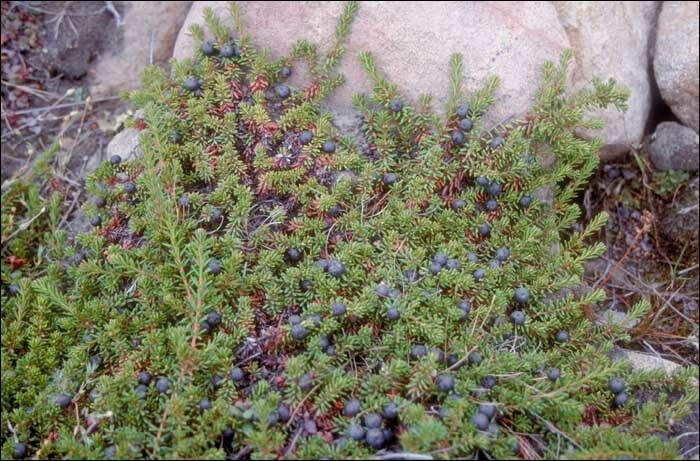 The word paurngaqutiti is used for crowberry patches. The berries were recommended for a person who had diarrhoea and are reputedly more effective in hardening watery stools than Kigutangirnait (blueberries, bilberries). If you eat a lot of Paurngait berries, the stool hardens. It is okay if you eat them with meat, but if you just eat the berries alone you'll get constipated. They are delicious when mixed with caribou fat. Today paurngait are also eaten as jam. As the weather gets colder, crowberries and other berries start to freeze on the ground. When it starts melting again, berries from the year before become visible and can even be eaten then. Augujjiaq refers to picking berries with a bowl with holes in it to drain the snow out. The bowl was used as a filter. People would dig in the snow, and put the berries into the bowl. The berries were not dried up. To store the berries, a hole could be made in the sand and some fat poured in. When the fat hardened the berries were put in, and the hole covered with seal skin. After the hole was covered it was further buried for a winter supply. The berries were found to keep very fresh." Crowberry branches made nice mattresses for iqluit (loosely woven summer mattress. Interpretation by N. Hallendy 2003). The branches with the leaves attached were used to clean gun barrels (Ootoova et al. 2001). The purplish black shiny fruits are very juicy and sweet but contain a number of large, hard seeds (Porsild 1957). In Alaska, large numbers of crowberries were picked in late summer and stored in seal oil for use in fall and winter (Ager and Ager 1980). Andrew and Fehr (2000) noted that a tea was made by collecting and boiling the roots, berries, and stems of this plant and that some Gwich'in people considered it as good as spruce gum tea for stomach aches and bad colds. 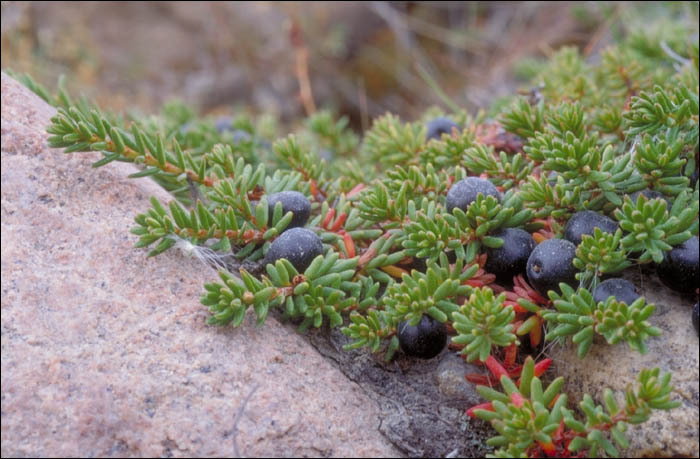 Porsild (1950) stated that because of its abundance and hardiness, the crowberry, although not as well flavoured as some other berries, is easily the most important fruit in Arctic regions. Rink (1857) claimed that a sparkling white wine may be produced by fermentation of the juice. Berries are used to make wine in Iqaluit (Mary Ellen Thomas, personal communication, 2006). They make a delicious desert when mixed with grated caribou fat, seal fat, and a little water. The mixture is carefully whipped and requires experience to get the best results (Eva Aariak, personal communication, 2006). Suvalik is a similar mixture of the berries with char eggs (Mary Ellen Thomas, personal communication, 2006). Ecology and habitat. Substrates: slopes, ridges, seashores; dry; rocks, gravel, sand; with low organic content; acidic. 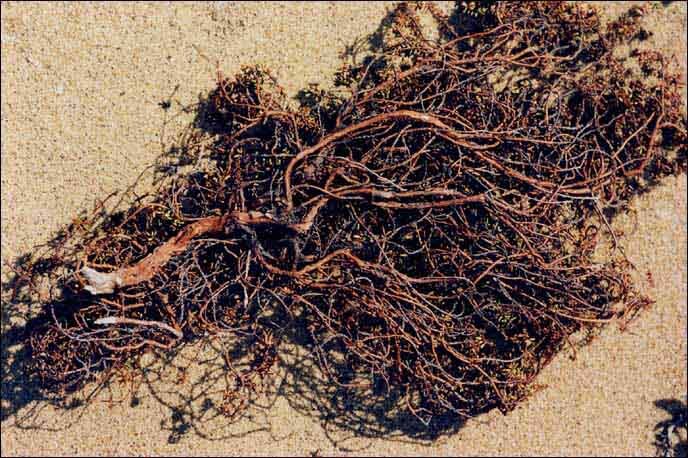 Often reported on rocky or gravelly slopes, E. nigrum is also found on sandy or gravelly upper beaches, or on flats near the seashore. It is associated with Vaccinium and Cassiope, and also occurs with Pyrola grandifolia. North American distribution. Northwest Territories Islands, continental Northwest Territories, Nunavut Islands, continental Nunavut, northern Quebec, Labrador. Range in the Canadian Arctic Archipelago widespread. Common. Arctic. Arctic islands: Baffin, Ellesmere, Victoria (literature record), Axel Heiberg, Somerset (literature record), Southampton. Northern hemisphere distribution. Circumpolar, or circumboreal. Northern Iceland, Northern Fennoscandian, KaninPechora, Svalbard  Franz Joseph Land, Polar Ural  Novaya Zemlya, YamalGydan, Taimyr  Severnaya Zemlya, AnabarOlenyok, Kharaulakh, YanaKolyma, West Chukotka, Wrangel Island, South Chukotka, East Chukotka, West Alaska, North Alaska  Yukon, Central Canada, Labrador  Hudson Bay, Ellesmere Land  Peary Land, West Greenland, East Greenland. General notes. Cody (1996) noted that flowers in this subspecies are polygamous. Kuvaev et al. (1996) studied the anatomy, morphology, and chemical composition of four Empetrum species in northern Siberia, E. hermaphroditum, E. nigrum, E. sibiricum, and E. subholarcticum, and recognised three groups, E. nigrum, E. hermaphroditum, and E. subholarcticum, on the basis of the flower sexuality. Kudo et al. 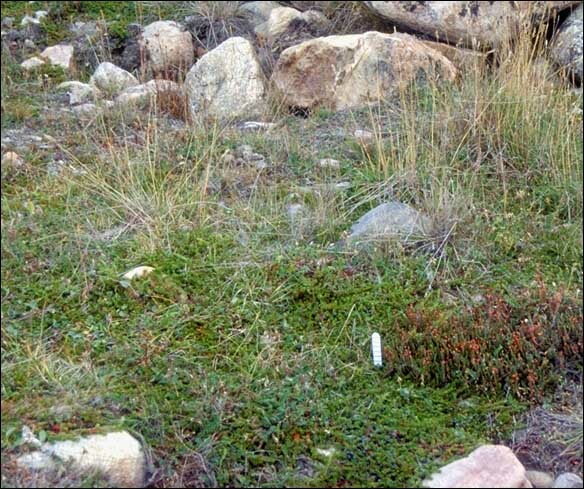 (1999) studied the effects of snow-melt timing on leaf traits (for five deciduous and five evergreen species), shoot growth, and leaf production (for five evergreen species) of tundra plants along a snow-melt gradient in an alpine snowbed in northern Sweden. 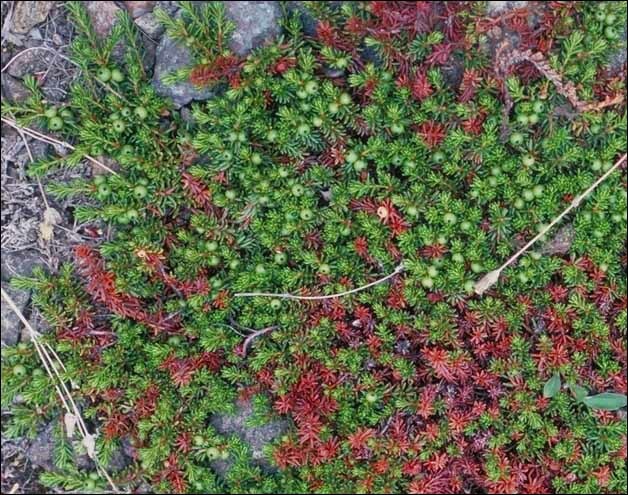 In the two predominantly boreal evergreen species Empetrum nigrum and Vaccinium vitis-idaea, leaf life span was negatively correlated with both annual leaf production and shoot growth, but there were no similar significant correlations for the other three, strictly arctic-alpine evergreen species that these authors studied. Phytochemistry. Kallio et al. (1984) found that in E. nigrum the content of glucose was 2.8 ± 0.1 g/100 mL, fructose 2.6 ± 0.1 g/100 mL, and the sugar alcohol inositol 0.02 g/100 mL. Traces of galactose were identified. Sucrose was absent in all samples (less than 0.01 mg/100 mL). Hethering et al. (1984) found no evidence to support the suggestion that lipids (triacylglycerols) play a major energy storage role in the leaves of alpine E. nigrum. These authors suggested that the presence of a well-developed waxy cuticle might account for the high total lipid levels encountered in dwarf evergreen shrubs. Puntari et al. (1985) extracted volatiles from the black berries of the crowberry, Empetrum nigrum, with steam distillation and capillary GLC-MS analysis and found 33 volatile compounds, among which benzoic acids and benzyl alcohol were the main ones. Fifteen compounds known to exist in blueberries (bilberry, bog blueberry, and high-bush blueberry) were found in crowberry. Esters of hydroxy acids, which are most important and characteristic of bilberries, were totally absent, which explains the very mild aroma of crowberry that is otherwise similar to that of blueberries. Saratikov et al. (1991) found anticonvulsive activity in an ethanol extract from the aboveground part of E. nigrum and compared it with that of benzonal in experiments carried out on mice and rats. The extract exhibited anticonvulsive properties in the models of corazole-, camphor-, strychnine-, and nicotine-induced convulsions and at maximal electroshock. The extract prolongs the effects of sedation and exhibits moderate H-cholinolytic, hypothermic, and analgesic activity. Matsuura et al. 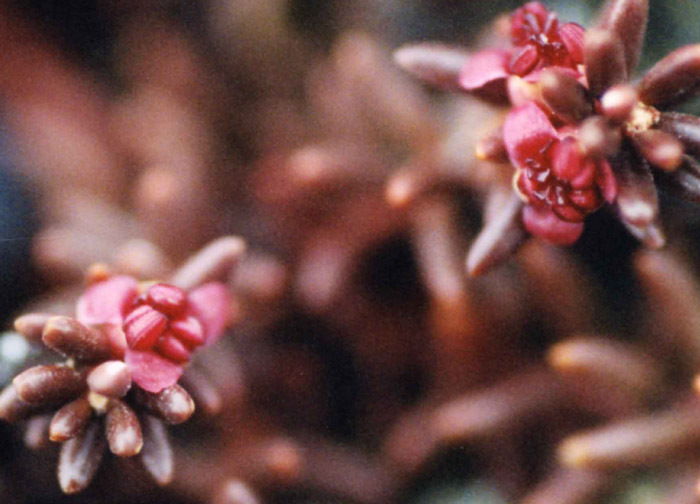 (1995) documented the occurrence of antibacterial and antifungal compounds in Empetrum nigrum. Pollen morphology. 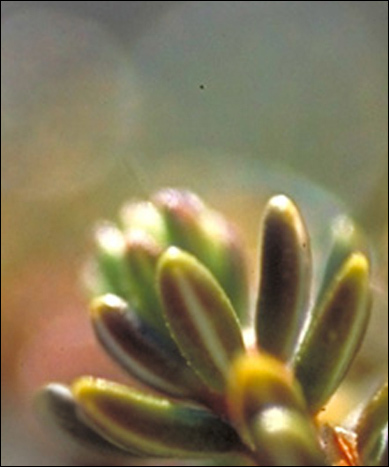 The pollen grains of Empetrum were studied using both light and electron microscopy by Warner and Chinnappa (1990). They found that the grains are the typical tetrad form of most Ericales and that E. nigrum has tetrahedral tetrads with 12 compound costae. The tetrads of E. nigrum subsp. hermaphroditum are larger than those of subsp. nigrum and possess 12–16 compound costae per tetrad, which the authors suggested is related to polyploidy. Cytology. In northern Europe, the distribution of the cytotypes, there named as E. nigrum L. and E. hermaphroditum, were mapped based on literature references and original data (Velluti et al. 1995). These authors showed that the diploid taxon E. nigrum, 2n = 26, is mainly distributed in central Europe and is rare in the Alps. The tetraploid taxon E. hermaphroditum, 2n = 52, has a more northern distribution and is frequent in the Alps and northern Apennines. In the geographic areas where both taxa are present, they are never simultaneously present in the same habitats. The diploid taxon is almost exclusively linked to peat-bogs, and the tetraploid taxon, to windy peaks with scarce and short-term snow cover. Wood anatomy. Carlquist (1989) analysed the wood and bark of 12 collections of the Empetraceae and found that the family has vessels that are somewhat angular in cross section, with scalariform perforation plates and scalariform to opposite vessel-ray pitting. Imperforate trachery elements are all trachieds. Axial parenchyma is sparse and not subdivided. Rays are characteristically uniseriate and composed of upright cells. Older stems have rays with both upright and procumbent cells. These features ally Empetraceae closely to Ericaceae and Epacridaceae. The narrow vessels are quite numerous per mm2 and denote a high degree of wood xeromorphy. The growth rings and tracheids may also be indicative of adaptation to drought or physiological drought due to cold. The wood samples demonstrated the accepted criteria for paedomorphosis with rays composed of upright cells, non-conversion of the uniseriate rays to multiseriate or heterocellular rays, and a decrease in vessel element and tracheid length with age. Illustrations. 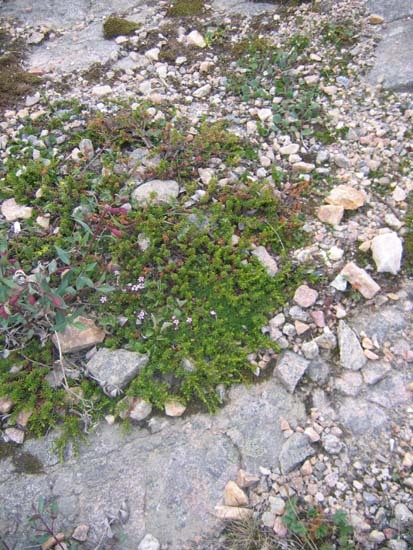 • Habitat of Empetrum and Cassiope: Iqaluit. Empetrum (in front of white marker) growing beside Cassiope with the grass Hierochloe alpina (background) on a rocky hillside. Nunavut, Baffin Island, Iqaluit. Aiken 97–005 and 97–006. Scale bar in cm. • Habitat: Cape Dorset. Plant growing with fireweed in disturbed gravelly habitat. Nunavut, Baffin Island, Cape Dorset. 2 August, 2005. Aiken. No voucher. • Undersurface showing branching stem. Underside of an Empetrum plant that had the soil washed out from around the stem and roots. Found at high water level, on the banks of the Soper River. Nunavut, Baffin Island. Aiken 2002. No voucher. • Close-up of stem apex. The undersurface of leaves at the stem apex. The upper adaxial surface is a darker green and rolled over the lower surface. The lower surface appears as a pale green strip when the leaves are young and is less obvious in mature leaves. Nunavut, Baffin Island. 4 July, 2002. Aiken. No voucher. • Flowers blooming. Left, flower with petals open and large pre-anthesis anthers but no evidence of the stigma. Right, flower has opened and shows reflexed petals anthers and branches of the stigma appearing in the centre of a flower. Photograph by Carolyn Mallory. 2003. No voucher. • Close-up of receptive stigma. Stigma in the centre of the flower has white highlights where the sticky surface has caught the light. Note the plant is flowering before the leaves turn green. Photograph by Carolyn Mallory 2003. • Habitat. Plant tending to die in the centre as seen by the brown leaves. Note immature green fruit. Plant growing on rocky till. Nunavut, Baffin Island, Iqaluit. 22 July, 1982. J.M. Gillett 18987. CAN. • Habit. Late-season plants with mature blue berries. Note needle-like evergreen leaves. Nunavut, Baffin Island, Iqaluit. Aiken 97–005. CAN. • Close-up of fruit. Mature, blue, Iqaluit "blackberries" with cylindral leaves. The leaf margins almost meet and surround an internal air space. Nunavut, Baffin Island, Iqaluit. Aiken 97–005. • Underside of fruits. Underside of fruits showing three creamy sepals, three browning red petals and narrow brown stamen filaments some with the remains of anthers. These indicate this is subspecies hermaphroditum, c.f. subsp. nigrum. Manitoba, Churchill. No voucher. Photograph by A. Brysting. • Arctic Island Distribution.